Summary: Barnacle Black Ear and his band of Buccaneer Bunnies are back! The floppy-eared scallywags are busy -- shooting one another out of cannons; swinging from the masts of their ship -- too busy to listen when Henry finds a threatening message in a bottle. While Henry works frantically on his book, HENRY'S PLAN FOR IMPENDING DANGER FROM THE UNKNOWN ENEMY WHY WROTE THE SCARY NOTE, his mates bowl with coconuts or dig for treasure, and his father, Black Ear, bellows that Henry is wasting his time. 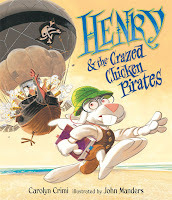 But when Crazed Chicken Pirates attack the unsuspecting Bunnies, will Henry and his book save the day? I had a sneaking suspicion that Booking Son would enjoy HENRY & THE CRAZED CHICKEN PIRATES written by Carolyn Crimi and illustrated by John Manders. Ever since we visited Disney World (and truth be told even before that), he's loved all-things pirates. So to find a cute book filled with animal characters and pirates... well, let's just say he really liked this silly book! Henry is an adorable character who becomes worried when he reads a note telling him that his worst enemy is going to come and take all of his loot (which just happens to include books!) Henry is a tad bit worried (and what book lover can blame him?) about the threat and decides to write a book about being prepared for an attack. Instead of having fun like the rest of his crew, Henry begins reading, researching, and writing about how to protect their loot. It's a good thing he was ready for the attack because Henry ended up saving the day! I really enjoyed this book as did Booking Son. We laughed a lot and I loved Henry and his "nervous Nelly" personality. I liked that this book, while being entertaining, also had some good messages such as the value of reading and research, the importance of writing, and knowing when to be prepared. Of course, I'm not entirely sure that my son ended up with all of these messages, but he sure did love the parts of the story when Henry wore his Parrot-Poop Helmet! I highly recommend HENRY & THE CRAZED CHICKEN PIRATES for preschoolers through early elementary age children. I think the book is perfect for reading aloud especially at bedtime or story time. There are lots of laughs and good lessons too! Thanks to Blue Slip Media for sending me a copy of this book. I don't think males ever outgrow their love of pirates! This sounds like a fun book!